Bury-based JD Sports Fashion Plc said on Monday it agreed to acquire Rochdale-based Footasylum Plc in a deal valued at up to £90.1 million. That price would be roughly half of what Footasylum was valued at when it went public in late 2017, according to Reuters data. Footasylum shares soared 72% to around 80p on the news, slightly below JD Sports’ cash offer of 82.5p per share. Footasylum ‘s initial public offering was priced at 164p in November 2017. JD Sports executive chairman Peter Cowgil said: “We are pleased to make this offer for Footasylum, which is very complementary to our existing businesses in the UK. Footasylum executive chairman Barry Bown said: “The Footasylum board has concluded that the offer represents the best strategic option for Footasylum and its employees. JD Sports said shareholders representing about 63% of Footasylum’s equity have agreed to the deal. “With 63 (percent) irrevocable undertakings this looks like a done deal,” said Edison Investment Research analyst Paul Hickman. 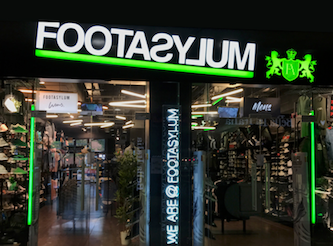 Patrick O’Brien, GlobalData’s UK Retail Research Director, said: “While JD Sports is paying a 77% premium on Friday’s closing price, the 82.5p bid is almost half of Footasylum’s IPO offer price when it listed just 16 months ago. “Footasylum went for rapid growth but the wheels started to come off in May last year as a highly promotional market forced its margins down and choked the supply of cash needed to build out its store network. “The resulting profit warnings and dialling down of capital investment plans devastated its market capitalisation. “For JD Sports, this looks like a defensive move against Mike Ashley’s Sports Direct. “With Footasylum’s share price so low, it looked like only a matter of time before the hoover of the high street would strike, before JD Sports began building its stake last month.